Free 2-day Shipping on any carrier purchase! Home / Go Anywhere / Does your baby need a little boost? Does your baby need a little boost? We often will get questions about how to boost the baby once they reach the in-between stage of newborn to just a little older than newborn, 3-4 months. This is when they are too big for the Booster but not quite big enough to see over the top of the carrier. This really depends on your baby's development but once they have independent head control and they have reached 3 or 4 months old it is not necessary to use the Booster any longer. We have found a really nifty way of giving your baby an extra boost for this next stage. 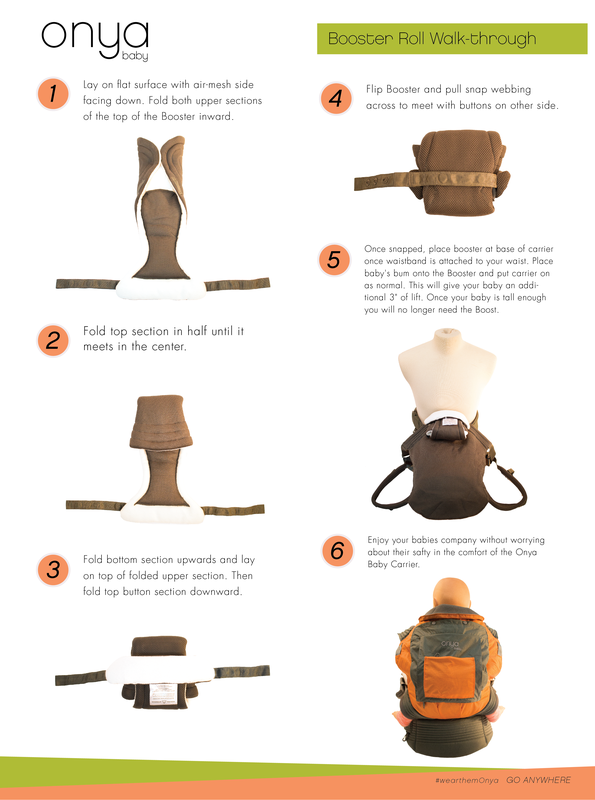 If you already have a Booster this diagram will show you how to fold up the Booster and place it into your baby carrier to give your little one an extra height. This will help keep baby nice and close so you can still monitor their breathing and also help them see over the top of the carrier.